The Inspera team is proud to partner with Gothenburg University to realise a large-scale deployment of e-assessment. 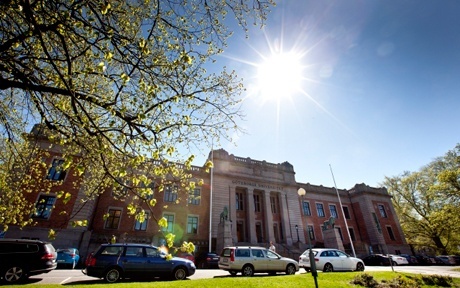 The University of Gothenburg was established in 1891 in Southern Sweden and with 38 000 students and 6 000 employees, it is one of the largest universities in Scandinavia. The University of Gothenburg was number 170 on The Times Higher Education World University Ranking in 2017. In autumn 2015, Gothenburg University ran a public tender process and received 5 bids from suppliers of e-Assessment solutions. After thorough evaluation and user testing of different solutions, Inspera Assessment was selected as the preferred platform. According to Linda Jerdenius, System Administrator of the university, “since 2015 Inspera Assessment has been supporting digital examinations for the University of Gothenburg in a mainly bring-your-own-device setup, which Inspera Assessment has supported in a secure and smoothless way. The project has been met with positive uptake by all staff groups, and students are overwhelmingly satisfied”. The project has been met with positive uptake by all staff groups, and students are overwhelmingly satisfied. Gothenburg University has chosen a gradual implementation policy where digital examination is a service offered to examiners (academic staff) on a voluntary basis. After the dates for the exams are set, the examiner notifies the university whether they want the exam to be carried out digitally or not. The teacher is then offered a training session before getting access to the Inspera Assessment system. While a gradual and fully voluntary implementation requires more coordination and planning than a quick and full roll out, it does afford staff and students more time to become acquainted with, and adapt to, the new examination process.